Districts 1, 3, 4, 6, 24, 25 and 30. Duval, Clay, Nassau, St. Johns, Baker and Putnam Counties. Serving the Greater Jacksonville Area plus Fernandina Beach, Neptune and Jacksonville Beaches, St. Augustine, Orange Park, Macclenny & Middleburg, FL areas. Also including: Folkston & Kingsland, GA., Palatka, Keystone, Green Cove Springs, Interlachen, Crescent City, Starke, FL, Putnam County. Franklin, Gadsden, Jefferson, Leon, Liberty, Madison, Taylor and Wakulla Counties. Cities of Tallahassee, Perry, Quincy, Apalachicola. Cities of Bushnell, Clermont, Eustis, Leesburg, Tavares, Umatilla, Fruitland Park, Howey-in-the-Hills, Lady Lake, Lake Panasoffkee, Mascotte, Minneola, Mt Dora, Oxford, Sorrento, The Villages, Wahoo, Webster, Wildwood. Districts 8, 19, 20, 21, 32. Cities of Daytona Beach, Deland, New Smyrna Beach, Ormand Beach, Port Orange, South Daytona, Orange City, Edgewater, Deltona, Holly Hill, DeBary, Oakhill, Daytona Beach Shores. Districts 9, 10, 11, 18. Cities of Altamonte, Apopka, Bithlo, Casselberry, College Park, Forest City, Lake Buena Vista, Lake Mary, Longwood, Maitland, All Greater Orlando, Sanford, Windemere, Winter Garden, Winter Park. Cities of Barefoot Bay, Cape Canaveral, Cocoa, Cocoa Beach, Indialantic, Indian Harbour Beach, Melbourne, Melbourne Beach, Merritt Island, Palm Bay, Port St. John, Rockledge, Satellite Beach, Suntree/Viera, Titusville. Cities of Brooksville, Spring Hill. Baker, Bradford, Columbia, Hamilton, Lafayette, Suwannee and Union Counties. Cities of Lake Butler and Lake City. Cities of Dunnellon and Ocala. Cities of Flagler Beach, Bunnell, Beverly Beach and Palm Coast. Dixie, Gilchrist, and Levy Counties. Cities of Cross City, Trenton, Bronson, Chiefland, Williston. Cities of Crystal River, Dunnellon, Inverness. Cities of Kissimmee and St. Cloud. Linguistic District, Spanish. 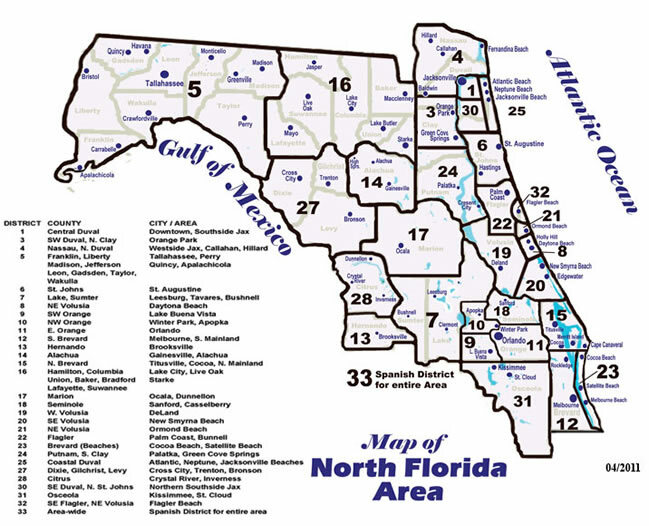 All Counties, North Florida Area.